Obviously, Portuguese culture is different from the United States. At first, these differences seem strange and annoying. While living in Portugal for two years they become interesting. After returning home, these are the unique experiences that endear Portugal to us. Beijinhos, the traditional method of greeting friends by kissing once on each cheek. The grocery carts that require a coin deposit. Azulejos that decorate the buildings. The variety and quality of the breads. Also, padarias everywhere. So many Catholic Churches and cathedrals, often on adjacent corners or pracas. Bolachas wrapped in tubed packaging. Many, many varieties of bolachas in Jumbo. Whole aisles in the grocery stores solely dedicated to azeite. All the small cars. While not unique to Portugal, most new missionaries are surprised by all the diminutive cars and the paucity of large cars. Mercedes Benz taxis and garbage trucks. 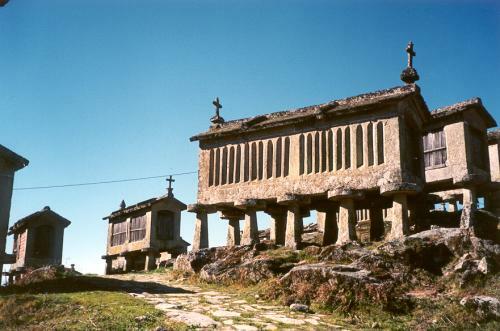 Espigeiros or corn cribs are made out of stone and elevated on stone stilts. Click here. The pastries were delicious. You couldn't serve in Portugal and not eat a Bolo de Berlim at least once. Plus the farturas at all the feiras were very tempting. And the lancheiras of Viseu will never be forgotten. Widows wear black for the rest of their lives. The Galo de Barcelos. This is a very unique icon that has become the unofficial symbol of Portugal. For a picture and legend of the Galo (or rooster) follow the link. Click here. The beautiful pottery. The items from Vista Alegre were especially beautiful. The dishes in the mission home were from them. Cobble stones and the fancy paving stones in the side walks. Bacalhau and its unique smell. The narrow, winding streets in the old parts of the cities and aldeias. The many varieties of chourico, presunto, & tripas. Each region of the country has their own version and flavor of Chourico and presunto. Stores would have large sections displaying the many varieties of each. Cemeteries with above ground Mausoleums, resulting with a look of a small city. Also, only burying people for five years. Rotundas or round abouts in English. These are the circles at traffic intersections where in you enter a large circle of cars until you come to your intersection and exit. The center islands of the circles often have statues, fountains, or gardens. The bread known as Broa. This is a very heavy bread made with corn meal. Each region has its own flavor and texture with the Broa de Avintes being the most famous, and maybe the most potent. Click here. The ubiquitous, one piece, concrete basins used for washing laundry. The 50cc motorcycles without mufflers that are always wound up to the max. Some have a plastic shell that make them look like bullet bikes. Bollycao, a hot dog bun filled with chocolate. This speciality is common to Portugal and Spain. Luncheiras. Hot pockets stemmed from these famous pocket sandwiches that come from Viseu. In fact, each community had their own version of luncheiras. If you remember something unique to Portugal, please submit it.